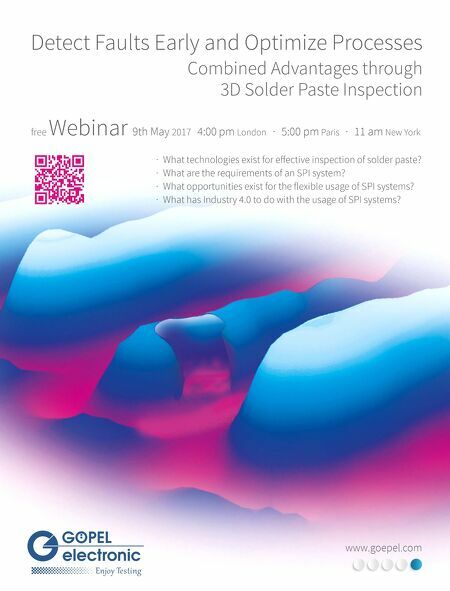 Detect Faults Early and Optimize Processes Combined Advantages through 3D Solder Paste Inspection www.goepel.com free Webinar 9th May 2017 4:00 pm London · 5:00 pm Paris · 11 am New York · What technologies exist for effective inspection of solder paste? · What are the requirements of an SPI system? · What opportunities exist for the flexible usage of SPI systems? · What has Industry 4.0 to do with the usage of SPI systems?